There are so many reasons as to why you want to transfer files from your Xiaomi device to other gadgets - for backup, share, edit, etc. Although Xiaomi file transfer is an easy task, it can also end up being very challenging for some users. But it doesn't matter, this guide will give you detailed methods on how to easily transfer Xiaomi data. These methods have undergone scrutiny and have been proven to be very efficient and effective. Android File Transfer - How to Transfer Contacts from Android to PC/Computer? Now let's see what these transfer ways are and how to perform them! 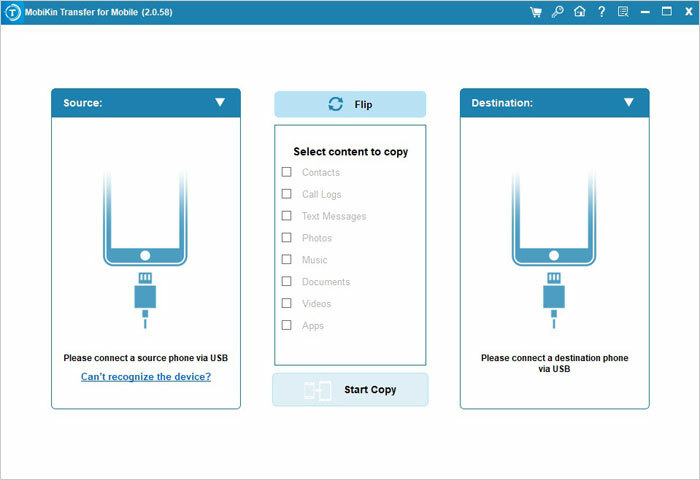 Using MobiKin Assistant for Android is the main and the most amazing method that not only allows Xiaomi file transfer but also file management. 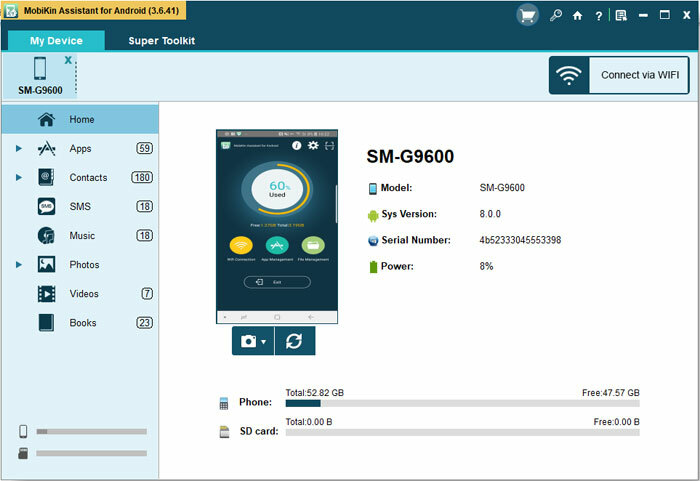 With this powerful desktop program, you are able to export, import, add, delete, edit, backup and restore your Android files without any hassle. 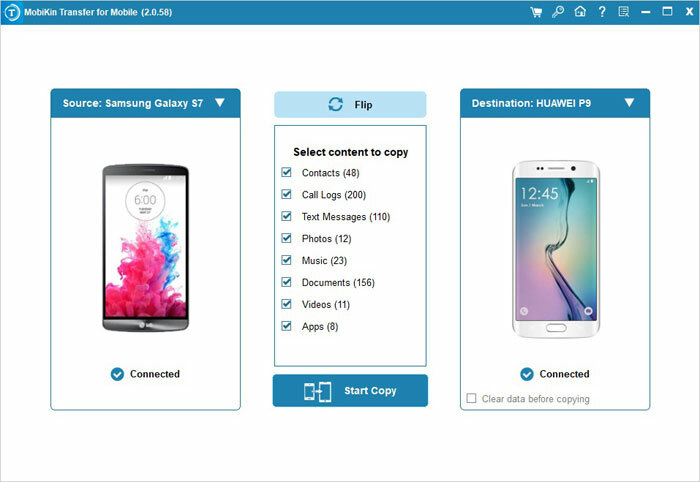 And the file types that you can manage with it are various, including contacts, text messages, call logs, music, videos, photos and so on. It provides you with two versions: Windows and Mac. You can choose the one you need and then follow the step-by-step tutorial below to start transferring the data on your Xiaomi device. 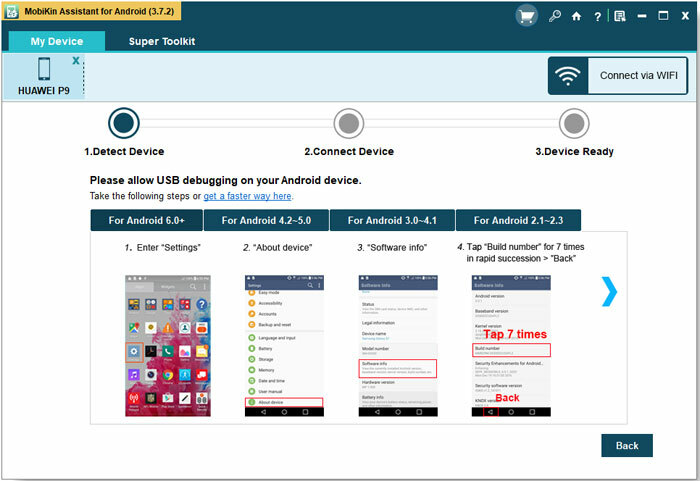 - Connect via USB: Connect your phone to computer with a USB cable and then enable the USB debugging and authorize the connection on your device if required. 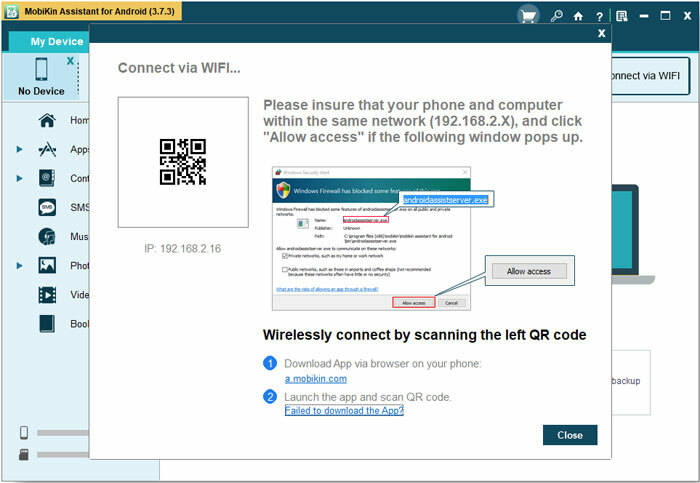 - Connect via Wi-Fi: Choose "Connect via WIFI" on the primary interface of the software and install the MobiKin Assistant for Android (Android Version) on your Xiaomi device. Then you need to launch the application on your mobile phone and click on "Wifi Connection" to scan the QR code on the program. Tips: If you choose to connect via Wi-Fi, you should ensure your mobile phone and PC are set in the same network. As you can see, all the files on your device are listed in the left panel. Just click the folder containing the files you want to transfer and then its contents will be located to the right panel. Now you can preview the data and check the wanted files. At last, you can easily tap on the "Export" button located at the top menu to start transferring the selected files. Making use of Mi PC Suite is another common way to perform the Xiaomi file transfer. Mi PC Suite is the official Mi device desktop client that allows you to share PC internet, manage files, backup & recover data and flash Mi devices. 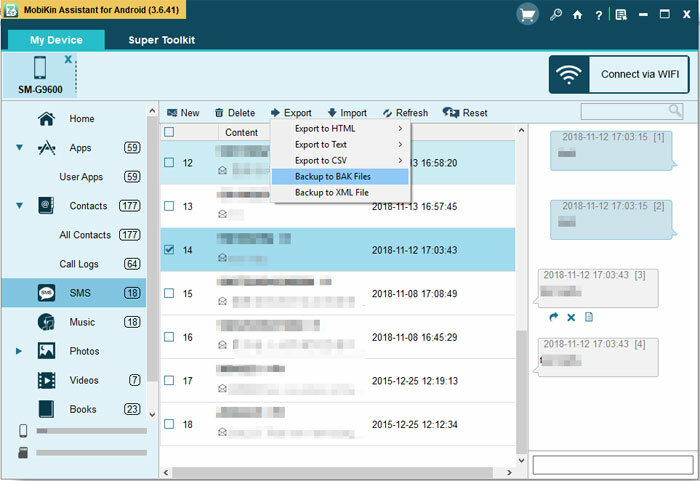 Its supported file types include contacts, messages, Apps, photos, videos, songs, note, etc. Download, install and launch the Mi PC Suite on your computer and then connect your Xiaomi phone to the PC with a USB cable. After that, the program will detect the connected phone automatically and you need to make the device be recognized by following the prompts. After the recognition, you will get the following interface. Just tap on the folder that you wish to transfer, such as "Photos". Then you can tick off the desired pictures. Hit the "Export" button and the chosen files will be moved to your computer. The Mi PC Suite is only compatible with the Xiaomi devices and its supported file types are limited. So if you wish to transfer more file types or sync data from other Android devices, you should go back to the Method 1. This is the most common and easiest ways to transfer files from your Android phone to your PC. All you need to do is to make sure that the USB cable is fully functional. You will then have to follow the simple steps below, and in no time, you will be busy transferring files. Connect the Xiaomi phone to the computer using a USB cable. Then pull down the drop menu from your Xiaomi home screen then choose a proper USB option - "Transfer files (FTP)". Turn to your computer and click on "This PC" > "your Xiaomi phone". You will see that all the transferrable files on Xiaomi phone are displayed on the computer. Just select the files you want to send. Finally, you can cut, copy or simply drag the desired files to your computer. By using this means, you can accomplish the file transfer with a simple USB cable. However, it only allows you to move media files like music, videos, photos, etc. between your Xiaomi phone and computer. Bluetooth is one of the most universal methods of Xiaomi file transfer. If you don't like or fail to use other methods, you can try Bluetooth. This method is very useful only if the devices are in close proximity. You can use it to transfer Xiaomi files from one phone to another and most importantly from phone to a computer. Switch on the Bluetooth option on both devices and you will be required to make the devices discoverable. Then your Xiaomi device will scan for available devices and pair with the phone, computer or tablet you want to transfer to. Select all the files that you want to send and share with the device. Then you need to confirm the transfer on the other end and the files will start trickling in one by one. The time taken to complete the file transfer depends on the size of the file. So this method is often very effective when transferring small files. But transferring big files using this way tend to take a relatively long time. Apart from moving to computer, some users might also need to sync the data on their Xiaomi device to another mobile phone. Then how to complete the phone to phone transfer effectively? Don't worry! MobiKin Transfer for Mobile can help you. With it, you are capable of moving your Xiaomi files to other Android phone or iPhone with simple clicks. If you are interested in it, you can click the icon below to download the software and then use it to sync your phone data. At first, you need to launch the program and connect both your mobile phones to computer via USB cable or Wi-Fi. Then you should make them be recognized by following the prompts on the screen. Once finishing the recognition, the connected phones will be listed on the program. Here you need to check if your Xiaomi device is the source device. If not, you can click on "Flip" to change their positions. Now you can mark the file types that you want to transfer and hit the "Start Copy" button in the middle to begin the transferring process. - Android to iDevice transfer: contacts and books. It is evident that the above methods are very easy to use and completely reliable. You can choose the one you like to perform and complete the Xiaomi file transfer effortlessly. And if you have any problem about the tutorial or have other better ways to sync the files, please feel free to share with us.